The Flocculation unit is a dewatering device that eliminates the use of reserve pits, recycles water and converts large amounts of waste drilling fluids to a small volume of solids which can be recycled for a more beneficial use. The Flocculation functions by continuously analyzing the constantly changing chemical and physical characteristics of drilling fluids and optimally treating the fluids with polymer to enhance solids removal. The unique polymer hydrating and blending features, as well as the shear sensitive mixing devices, create an ideal mixture for low cost and efficient solids separation. The equipment is automated through the use of sophisticated process controls. 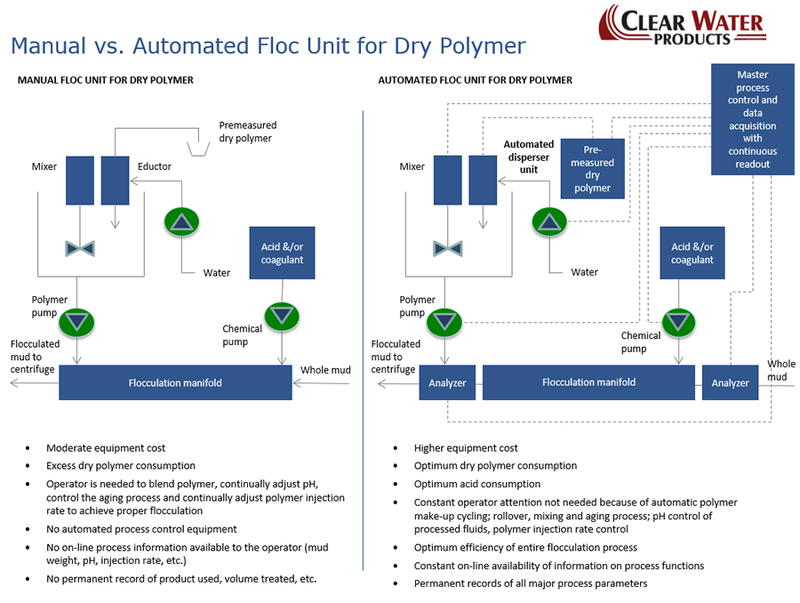 The automation, coupled with the polymer makeup, blending and mixing features, enable the Flocculation Unit to function dependably and efficiently with minimal polymer consumption. Clear Water’s computer continuously records and maintains a permanent record of processing rate, mud weight, pH and other readings for every foot of the hole. This information can be accessed remotely, making the drilling fluids information available in real time at distant locations. Increased ROP: penetration rate is increased with the use of the Flocculation Unit because the mud can be constantly maintained at a desired weight, and rig tanks do not require dumping. Downhole motor life is also extended by control of ultrafine particulates, thus reducing trip time. The Flocculation Unit keeps up with today’s high penetration rates. Information: a continuous record of mud weight, pH, water usage and polymer usage is recorded for every foot of the hole; available in real time and can be remotely transmitted. High Dependability: the oilfield rugged equipment is designed for efficient, operational redundancy to minimize downtime. Automation can be bypassed for manual operations in the event of a power failure. The Flocculation Unit is heated and insulated and can operate in temperatures of -40F and below.